Vladimir of Kiev goes to execute Rogneda of Polotsk, but Iziaslav of Polotsk comes to her defence. The Belarus Monarchist Association, founded in 2015, was established to provide support for the Prince of Miensk and the House Polanie-Patrikios and to advocate for the restoration of Royal Belarus. It is administered by the Abbey-Principality of San Luigi. Membership of the Association is open to all who wish to support its aims, whether they are Belarusian nationals or not, and whether they live in Belarus or not. Details of membership are given below. When the Principality of Miensk was re-established in 1970, at the height of the Soviet era, the prospect of monarchical restoration in Belarus seemed all but impossible. Today, the prospects are slightly more optimistic. Monarchy offers a clear alternative to Soviet-style republicanism, and has far deeper roots than that ideology. The Association’s position is strictly above and indeed opposed to politics, and it does not hesitate to point out the role of both Church and Crown in the identity of the nation, and their superiority to man-made egalitarian and modernist viewpoints. The sovereign derives his temporal power from God by Divine Right, subject to no earthly authority, just as the Church also derives its spiritual power and authority from God. This divinely-instituted system of Absolute Monarchy, with King and Church united hand-in-hand for the good of the nation and ruling by ukase or decree, is that which is advocated by the Association rather than any modernist “constitutional” compromise that vests power in bureaucrats and politicians. Our vision sets out the way in which these elements could combine to form a forward-looking and practical proposition for the future. The Association is strictly opposed to the evils of Communism and Socialism. It honours the past sacrifices of those who have supported White Russia against the Bolshevists and supports the restitution of land and property according to its disposition before the 1917 Revolution. The outlook of the Association may be described as one of radical traditionalism. It is not seeking to live in the past, but rather it is looking to the past for guidance as to how to live in the present. Key to its immediate aims is that the people of Belarus, including those in diaspora, should have the opportunity to decide for themselves, through a referendum or other means, whether they wish to see a return to monarchism. The Association also believes that Belarus should seek its monarchist destiny as a fully independent nation with its own monarch and indigenous church and not as a part of a restored Russian Empire or as a satellite of the Russian Orthodox Church. The Association has come to accept that initially, Royal Belarus may need to obtain sovereign territory and re-establish itself as a recognized nation outside the traditional territory of Belarus. It seeks as a first stage to obtain the financial backing to purchase sovereign territory from a government. This sovereign territory could potentially be located anywhere in the world. Once developed, this territory will then form the basis for Royal Belarus to develop its practical vision as a cutting-edge nation with a rich heritage. Initially, this vision concentrates on the potential for Royal Belarus as an offshore financial zone. The Association has considered that in the current political situation it should continue to base itself in diaspora. Members of the Royal House do not travel to Belarus for reasons of safety at the present time and a number of Association members and officers who live in Belarus have chosen to remain anonymous for the same reasons. The home of the Association is in Norfolk, United Kingdom, with the capacity for other branches to be established in different countries as need arises. Periodic events for members of the Association offer an opportunity to meet the Prince of Miensk, to share ideas and support, and to build together the foundation for a future Royal Belarus. The Association has chosen to use the English language to deliver its website and other services. It does so aware that its principal support is among English-speakers in the wider diaspora rather than within Belarus itself at present. Belarus has its own language: Belarusian, but at present, only just over half the population can speak it. Most continue to speak Russian, the language of Belarus’s occupying power for many years. Membership of the Belarus Monarchist Association is available to all individuals who wish to support the restoration of Royal Belarus, whether or not they themselves are Belarusian citizens or of Belarusian ancestry. The annual fee for membership is UK£25, payable to the San Luigi Orders Charitable Trust. Application should be made using the Contact page. Renewal of membership for all members is on 1 January of each year, and there is no amelioration pro rata for members joining during the course of the year. The Imperial Guard is the ceremonial corps of the Royal House Polanie-Patrikios. The Knights Nobilis Excubitor of the Byzantine Order of Leo V the Armenian are de facto members of the Imperial Guard, with others appointed as necessary. The Constantinople Orthodox Institute was founded by Prince Kermit of Miensk on 1 January 2006. It is a study society aiming to foster interest in various aspects of Byzantine faith, history and culture, and membership is open to all interested in its work. Members are encouraged, through informal, self-directed study, to improve their knowledge of the Byzantine period through reading books, watching videos and doing research. Over the last few years, “The Excubitor” has listed a number of useful resources that may be helpful to Institute members. 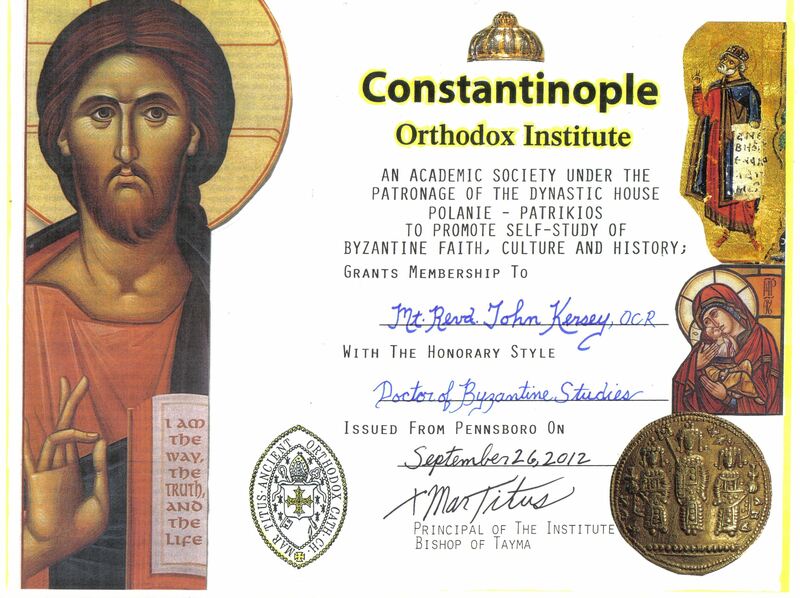 Persons whose work on the Byzantine era is of particular distinction may be awarded the honorary degree of Doctor of Byzantine Studies by the Institute. Honorary Doctorate of Byzantine Studies awarded by Prince Kermit of Miensk to the future Prince Edmond of Miensk, 2012.